Eurospa Eucalyptus Oil Uses: Get the Most Out Of Your Essential Oils with the Benefits of an Ultrasonic Diffuser! Get the Most Out Of Your Essential Oils with the Benefits of an Ultrasonic Diffuser! Using essential oils for Aromatherapy is not just a pleasurable way to scent your home, essential oils carry many inherent benefits for the mind and body. We are especially fond of our own Eucalyptus based shower spray; a spray made to be the perfect addition to any steam room or shower to cleanse and boost the respiratory and circulatory system. But there are many many oils out there and people are often curious about which are the best ways are to get receive the benefits of essential oils. The answer will always vary based on the condition a person wants to treat, but if you're looking to breathe in the benefits from the air while adding scent to your home, you'll likely want to consider an ultrasonic aromatherapy diffuser. Use Less Oil. 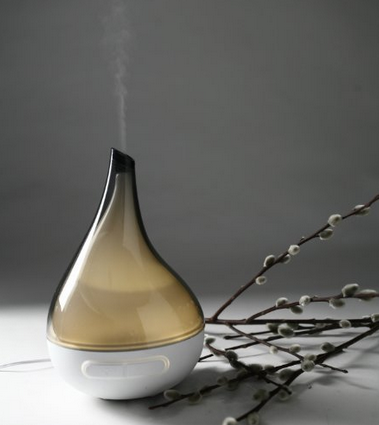 Diffusers that use heat burn through oils very quickly to disperse the same amount of scent into your air. When using an ultrasonic diffuser, you only use a fraction as much essential oil to get the same fragrance effect. Purify Your Air. These diffusers purify, sterilize and deodorize the air you breathe, which can help control allergies/hay fever, asthma, cold & flu symptoms, eczema/psoriasis, emphysema, etc. Improve Wellbeing. These diffusers circulate negative ions, which increase the flow of oxygen to the brain. This helps relieve stress, mental fatigue/concentration and headaches and improve breathing and sleep. Humidify. These diffusers humidify the air, which is useful in air-conditioned rooms or arid climates where dry air is harmful to the skin. Reap the Benefits of Oils. When using ultrasonic diffusers, essential oils are broken down into much smaller, lighter particles, than they do with heat methods. They can travel more deeply into your sinuses or down into your bronchial passages to do their healing work. Do your research and see which brand is best for you. Always read reviews and choose high quality products as your health is worth the investment. At Eurospa, we always strive to bring you the highest quality home and commercial spa products. This winter, we invite you to breathe in the benefits and feel good... naturally!